For many people food will bring happiness and as you can’t buy happiness but can buy food you are in luck. 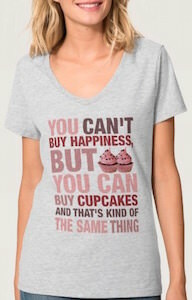 And now there is this women’s t-shirt that has the text “You Can’t Buy Happiness But You Can Buy Cupcakes And That’s Kind Of The Same Thing” on it and two cupcakes. You can get this cupcake happiness t-shirt in many colors and in sizes Small – 2XL and it’s made from 100% ringspun cotton and has a v-neck. 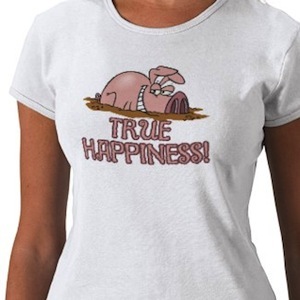 Just help the world out by telling them you secret to kind of happiness by simply wearing this t-shirt.